With the price of original brand Brother toner proving too expensive an option for everyday in-house printing, many businesses and home users are switching to compatible laser toner as it leads the way in reducing costs of prints per page. A laser printer is certainly a more cost effective way to print documents than an inkjet printer especially if you are producing large volumes of print. There are basically two types of Brother laser printer, mono (black and white) and colour. A Brother mono printer using the Brother TN2010 toner will produce approximately 1000 pages at 5 % coverage (this is one full page of A4 text printed using double lined spacing). The cost of the toner can vary especially when bought online but the fact is that you can get two high quality compatible Brother TN2010 toner cartridges for the price of one original brand cartridge. In effect, you are able to get 2000 pages of print for the cost of 1000 when you make the switch to compatible toner. With Brother colour laser printers, the printer will usually use four colour toners, black, cyan, magenta and yellow. Obviously these printers are much more expensive to buy than the mono printers and therefore it follows the toner will be more expensive too. These printers are excellent for use in the office and will print colour documents at great speed and still be more cost effective than going to a commercial printer up to a certain point. The Brother TN325 toner is a typical four-colour set of toners with the black toner printing approximately 4000 pages and each colour toner printing 3500 pages. 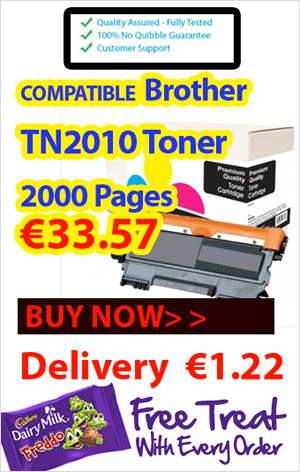 Again the cost can vary but it may be in and around €450 for a full set whereas you can get a full set of compatible Brother TN325 toner for under €150 and get a free black toner to boot! The compatible Brother toner cartridges are fantastic value and can save any business an absolute fortune over a twelve-month period and for those who haven’t tried them out, now is the time to make the switch. Maybe in the past there has been some negative press about compatible ink and toner and some people may even have had a bad experience using them but quality and reliability are now foremost in the suppliers minds as they strive to gain your repeat business. Uncertainty about the quality of the print may be a concern for those who have yet to try the compatible toner but there is no need to worry as all good compatibles are manufactured to the same ISO standards as the original brand cartridges anyway. All good reputable suppliers will offer a no risk money-back guarantee on their Brother toner and this is a sign of their confidence in their product. Also, good customer support from the supplier is important in the event that there are any issues (which there will be, including original brand toners), from time to time. With savings of up to 200% on the cost of original brand Brother toner or the ability to print 100% more pages by using compatible toner it seems like a no brainer not to make the switch to compatibles and start saving more on your printing today.